Probably not the most original idea, but it seemed inspirational when I thought of it. My collection of R8 collets is limited to 1/8" to 7/8" in 1/16" inch increments. So, holding small or odd size bits means using the drill chuck which takes up a lot of head room under the spindle and often means raising the milling head which is not popular with a round column mill. So, it occurred to me last night that I have several ER20 collet chucks and and a rather complete set of collets. As you can see, the collet chuck takes up a lot less vertical real estate than the drill chuck. 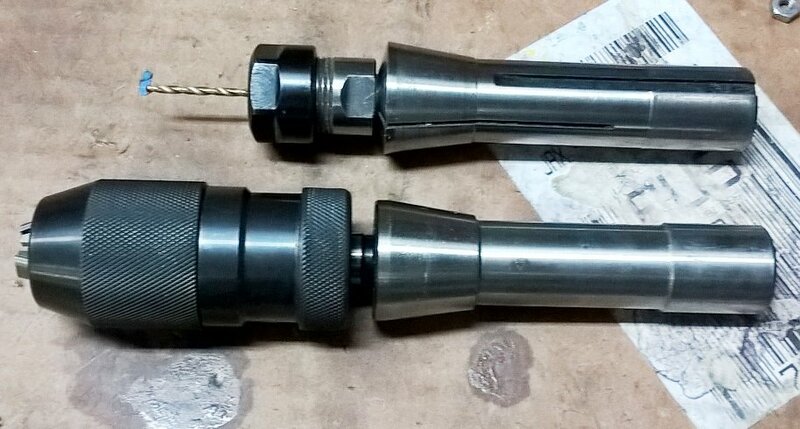 I did have to shorten the shank on the collet chuck to 3" so it would slide all the way up into the R8 half inch collet, but it was sitting on the shelf unused so no big deal. So now I can hold bits from about 1/16" up to 1/2" although I'm somewhat restricted on tool length on diameters over about 3/16". That's a smart solution, I use an ER-16 chuck to hold small drills and for workholding an ER-32 collet block and the collets I use on my milling machine. I also use the ER-32 collets for workholding on my lathe, they are vesatile. chuck that is the way to go, holding milling cutter is definitely not a good idea,just a perfect way for a disaster to happen even with small mills. Bad Behavior has blocked 13024 access attempts in the last 7 days.